On October 11, 2017, a large contingent of the Rapid Support Forces (RSF), Sudan’s largest paramilitary corps, redeployed to North Darfur’s capital, al-Fashir, from neighboring South and North Kordofan states. According to local media and eyewitness reports, the reinforcements consisted of some 10,000 fighters who arrived on 400 vehicles consisting of “technicals” (mini-trucks mounted with light to medium artillery pieces), armored vehicles, and water and fuel tankers. In his welcoming speech, the governor of North Darfur state, Abdel Wahid Yousif Ibrahim, indicated that the contingent was brought over to help local security forces implement the second and compulsory phase of a weapons collection campaign that the government launched in August 2017. What began in part as a disarmament and collection campaign has rapidly escalated into a volatile, high-stakes armed standoff that could dramatically alter the balance of power of a resource-rich region where large-scale violence has unfolded. In the days that have since followed the initial RSF deployments, according to numerous reports, RSF fighters and Sudanese government troops both increased their force size and activities significantly in the area. They have brought heavy military equipment and hundreds more vehicles, seized weapons and motorcycles, and engaged in bold personal attacks on individuals. Most notably these RSF fighters have recently entered the large and highly productive gold-mining area of Jebel Amer, which has been tightly controlled for several years by Musa Hilal, the leader of a rival armed group to the RSF and an outspoken recent critic of the Sudanese government. There are also multiple reports of heavy government and RSF forces moving to other areas near Jebel Amer, including another key stronghold area of Hilal’s: Saraf Omra. These recent events suggest dynamics among groups in North Darfur that had stabilized and remained relatively peaceful for a time may be quickly coming to a boil. But the situation is highly fluid, with a rapid surge in efforts by the region’s vitally important traditional authorities and mechanisms to defuse the situation as well. The Sudanese regime’s political and security incentives, prompting years of selective recruitment and weaponization of rival groups to serve its interests, have created and exacerbated the current situation. Beginning with the lead-up to the 2015 elections, President Omar al-Bashir announced his intent to rein in the tribes. He was motivated to do so because of rising levels of alarm within his inner circle of power at the growing political and military influence of the tribes at the expense of the ruling National Congress Party in the five Darfur states and three Kordofan states. This led al-Bashir to issue Presidential Decree Number 419/2017, establishing a High Commission for the Collection of Weapons in the States of Darfur and Kordofan, with immediate effect. The extensive territorial coverage of the commission’s mandate for all eight states reflects the extent of the harm that the regime has done by arming so many groups in these parts of Sudan. The most prominent tribal militias in the eight states were armed and equipped by the Sudan Armed Forces (SAF) itself, in conjunction with parallel and coordinated arming of other groups by the National Intelligence and Security Services (NISS). Presidential Decree 419 of 2017 required citizens to hand over any illegal weapons, ammunition, and unlicensed vehicles to the security forces or face legal action under Sudan’s criminal justice laws, including but not limited to the Public Safety Act, and the Arms and Ammunition Act of 1986. Chaired by Sudanese Second Vice President Hassabo Abdelrahman, the commission for weapons collection includes representation of all relevant ministries at the ministerial level. Presidential Decree Number 452 of June 11, 2017 further added to the commission the top commanders from SAF, the NISS, the national police, and the Rapid Support Forces. The commission was given powers to employ all means necessary, including detentions and the use of force, to disarm those they encountered. “All means necessary,” was interpreted to allow “shoot to kill” tactics with opponents of Decree 419. The first phase of the campaign has seen the collection of only a limited number (in the lower thousands) of the estimated hundreds of thousands of firearms known to be widely possessed by civilians, militias of all kinds, and paramilitaries operating under the nominal control of the government of Sudan in the eight states of Darfur and Kordofan. Reflecting the limited response to the campaign, the voluntary surrender of firearms yielded 2,000 pieces in South Darfur and 3,000 pieces in West Darfur as the deadline of the period for voluntary surrender set for mid-October 2017 approached. Successive governments in Sudan have armed civilians and militias recruited on an ethnic basis to wage war against armed insurgencies. Arming these fighters is considered a cheap option, both in monetary terms and for reducing human losses among privileged elite classes. The regime of President Omar al-Bashir, however, carried the practice to unprecedented levels. It did so because of its drive for political survival and security that went beyond the narrow military expediency that prevailed in the no less ill-advised and supremacist calculations of the military establishment that was in place under President Jaafar Nimeiri (who held power between 1969 and 1985) and Prime Minister Sadiq al-Mahdi (who held power between 1986 and 1989). The result is that now entire areas in Sudan that are affected by rural insurgencies are awash with firearms that are held by government-sponsored militias, paramilitaries consisting of militias integrated in the armed forces, members and former fighters of armed insurgent groups, and ordinary citizens. The government of Sudan scored a major political and diplomatic success with the lifting of U.S. trade and financial sanctions that had been imposed on account of Sudan harboring international terrorist groups in the 1990s and perpetuating atrocity crimes against its own citizens in conflict areas. On the heels of this diplomatic success, the weapons collection campaign appears to be meant to present the regime of President Omar al-Bashir to the international community as a guarantor of domestic and regional stability. The effort appears to have worked, with the U.S. chargé d’affaires in Khartoum reportedly welcoming the disarmament campaign after a briefing by the official overseeing its implementation, Vice President Abdelrahman. The welcome would appear premature because of the selective and heavy-handed approach the campaign has adopted from the beginning that risks backfiring. A successful disarmament and weapons collection campaign in Sudan would require the Sudanese government to develop a comprehensive strategy to address root causes of conflict that pushed individuals and groups to arm themselves in order to protect their families and communities. 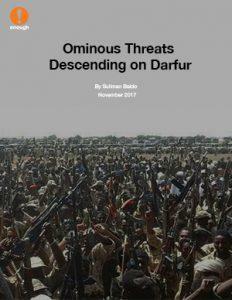 The militarization of the citizenry in Darfur and parts of Kordofan and eastern Sudan has been a process that developed over decades in a context of multiple armed insurgencies and as a result of short-sighted government strategies for waging counterinsurgency through proxy tribal militias. The systematic arming of tribal militias by the government without strict systems for the control and tracing of arms further aggravated the situation in many places where weapons could be purchased from arms traffickers, and an underground weapons market thrived. The collapse of law and order institutions and the disintegration of rule of law under the watch of the current regime also deepened the sense of insecurity and provided added incentives for people to arm themselves. Local intercommunal disputes over dwindling land and water and over newly discovered mineral resources also encouraged tribes to build up their military capabilities with the full complicity of government security agencies that prioritized their counterinsurgency interests. Sudan desperately needs a good disarmament campaign. However, the manner in which the current campaign is unfolding bodes ill for its outcome. It is entirely driven by narrow, short-term security considerations, and it fails to address the factors that led to the spread of weapons outlined above. As a result, the campaign received a lukewarm response from the public and no collective militia response to our knowledge. On the contrary, the disarmament campaign triggered major tribal tensions in Darfur and sparked an ominous armed standoff between the two largest paramilitaries in the country, the Rapid Support Forces and Border Guard Forces. To lay the foundation for a more effective and broadly beneficial disarmament campaign in Sudan, the Sudanese regime should prioritize a comprehensive and inclusive peace with the Darfur armed groups that rejected earlier limited solutions and with the Sudan People’s Liberation Movement/Army-North (SPLM/A-N) that fights the regime in South Kordofan and Blue Nile states. The Sudanese regime should disarm the tribal militias and paramilitary groups that are armed by its own security agencies to curb the violence that occurs in intercommunal clashes in which these militias engage on the sides of their tribes. If the government were to disarm the militias and paramilitary groups that it had armed to begin with, other tribes might be convinced to follow suit. The disarmament of the tribes would require a phased process involving the kinds of trust-building measures that are familiar to disarmament, demobilization, and reintegration (DDR) experts. Involving a party such as the United Nations and African Union Mission in Darfur (UNAMID) as a facilitator and guarantor of the campaign would be crucial to encourage the progressive disarmament of Darfur’s many tribes. The Sudanese government must also implement the legal and institutional reforms it has endorsed in a number of peace agreements, including but not limited to the 2005 Comprehensive Peace Agreement, the 2006 Darfur Peace Agreement, and the 2011 Doha Document for Peace in Darfur. Opting for a policy of “shoot to kill” tactics targeting those who are reluctant to surrender their arms in Darfur, as instructed by the vice president, is a recipe for disaster that could plunge Darfur into a new phase of bloodshed. A comprehensive and lasting solution to conflict in Darfur requires addressing the rights of the 2.5 million direct victims of ethnic purges and pursuing justice and reparations for what they have suffered through no fault of their own. Their right of return to areas from which they were driven during the successive ethnically targeted attacks over the last decade and a half should be respected and facilitated as appropriate. Perpetrators of the worst atrocity crimes and those who instructed them to commit such crimes should be held accountable. Only with such forthcoming admissions of the wrongs committed in Darfur and remedies for those affected will the Sudanese regime be able to bring back social peace and lasting stability in Darfur.